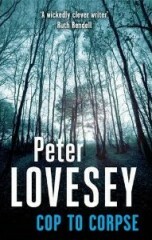 Peter’s new book appears from Sphere in the UK on 5 April, 2012 and from Soho Press in the USA in June, 2012. Bath detective Peter Diamond takes on the most dangerous assignment of his career when he goes in search of the Somerset Stalker, a killer who is targeting policemen in West Country towns. After a constable from Diamond’s own police station is murdered in the small hours of a Sunday morning a desperate hunt follows. Action, menace and courage in the face of extreme danger are the driving forces of this story laced with the surprises that always lie in wait in a Lovesey novel. 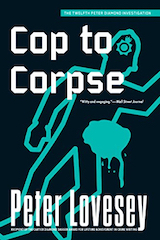 “Peter Lovesey is one writer who rises to the challenge again and again. . . . The story may be unorthodox, but it is certainly entertaining and proof – were it needed – that one of Britain’s most distinguished mystery novelists is still as good at keeping us guessing as ever. Long may he continue to entertain his many fans.” Martin Edwards, Do You Write Under Your Own Name?